It might have a brass name plate on the door, and a team of researchers diligently tapping away at their computers inside, but the Taxpayers' Alliance is a very different beast to the traditional Westminster think tank. Its offices feel like a cross between a media newsroom and the headquarters of a small political party. Framed newspaper headlines line the walls and, in a side room littered with placards and other campaign materials, there is a map of Great Britain studded with different coloured drawing pins showing the location of activists. The alliance was founded in 2004 by a group of "libertarian" Conservatives, frustrated by what they saw as the party's decision to ditch its traditional tax cutting message. "We thought they weren't really addressing the issue. 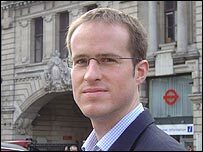 The Conservative Party which is traditionally seen as being the tax cutting party was going through a phase at the time, I think it is still going through a phase, where they think they need to match the Labour Party spending plans, in order to get into power," says chief executive and founder Matthew Elliot. "And considering the amount of money that the government spent has gone up so much in the past 10 years, we feel there is a body of opinion now out there, a body of people, who want to have lower taxes and lower spending, who are concerned about how the extra money Gordon Brown has raised has been spent." But rather than setting up a traditional think tank or pressure group - to churn out pamphlets and research papers that few outside Westminster would read - or starting a new political party, they decided the best way to get their message across in the current media and political was to launch a campaign. 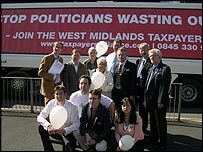 The idea of a campaign group representing taxpayers is a new one in Britain, although there are similar groups in other countries such as the US and France. Mr Elliott freely admits that the Taxpayers' Alliance message - that the state has become bloated and wasteful and that Britons are paying too much tax - is essentially the same as any number of other right wing think tanks and pressure groups. The difference, he argues, is in the way it is packaged and sold to the media. He is an admirer of the sort of hard-hitting, populist campaigns run by Labour in the 1990s, against City "fat cats" for example, and has tried to do the same thing from a "free market" right-wing perspective. Judging from the amount of coverage the group has received from across the media spectrum, it is working. The alliance has scored a big splash with its campaigns on inheritance tax, public sector 'non jobs' and MPs' expenses to name just three - and it claims to be averaging three media "hits" per day. It specialises in using the government's own data and Freedom of Information requests to winkle out examples of public sector waste; packaging it up into brief, media-friendly research papers, complete with an eye-catching headline figure to give reporters a ready-made "top line". "Journalists' budgets have been cut back massively and yet they have to produce much more content. They haven't got time to do a lot of the investigative stuff they used to do in the past. "So when we present them with some primary source material, it's guaranteed to be a good story." The Taxpayers' Alliance has also become expert in using opinion polls to get its message across. But the big difference - in terms of making an impact on the media and politicians - is that it is backed by a network of grassroots supporters. "The impression I get is that what the media like now is to have spokesmen representing groups in society and we have filled a niche in terms of speaking on behalf of tax payers in a credible and professional way," says Mr Elliott. "We have filled that niche in a way in which the 'experts,' the think tanks, haven't been able to do because they are seen as being, perhaps, more elitist." The alliance currently has about 18,000 registered supporters around the country, of which about 15%, or 2,700, are "activists," in the sense that they are willing to distribute leaflets and take part in protests. But there are no plans for any members to stand for election. The group has built its appeal, to a certain extent, on being "anti-politician" - Mr Elliott believes many of its supporters are people who have grown disillusioned with party politics. The alliance offers them a chance to campaign on an issue they care about without having to sign up to a raft of other policies which they do not care about, he says. The group also tries to keep meetings down to a minimum, which it believes members will find a welcome change from local party politics. Mr Elliott firmly denies the alliance is guilty of spreading cynicism about the political system. "I would like to think we have a positive message as well. Yes, a lot of our research publications highlight areas of wasteful spending, ways in which spending could be done in a better way. "That doesn't come from a perspective of just knocking the public sector for the sake of knocking it. We actually believe there is a better way of doing it. We have a very positive vision as well." But when it comes to recent revelations about MPs' expenses, he argues that they "have largely brought it on themselves". "We are not inventing stories about what they have done. The abuses that have gone on are well documented. The public are right to think the Derek Conway affair was beyond the pale." Mr Elliott believes the campaign group could eventually grow to rival the size of a political party in terms of membership and clout, matching similar groups in the US and France. "Ultimately the aim is to get into a position where, like some of the taxpayer groups overseas, we have hundreds of thousands of members and we are on track to do that." Many of the Taxpayers' Alliance's biggest donors also give money to the Conservatives, but Mr Elliott is at pains to stress that the group is not merely a proxy for the Conservatives Party. "In no way are we a Tory Party front group. We attack both parties. We don't actually think any political party in the UK is now representing those people who actually want to see lower taxes and less government spending." But he is also candid about what is in it for the donors - that they see the alliance as being able to "fly kites" for policy ideas that may go on to be adopted as Conservative policy. "We can actually go out there and say some of the things that the Conservative Party perhaps can't say. "We can say things about the public sector, public sector pay, staffing and waste and what have you, that they feel they can't say because, of course, they have got to appeal to the part of the electorate that still works for the public sector." 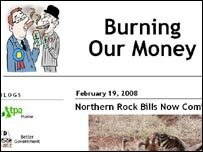 The Taxpayers' Alliance's first publication - "The Bumper Book of Government Waste" - grabbed headlines in The Sun and Daily Telegraph and helped open the door to potential donors. Within a year, Mr Elliott, a former researcher for Timothy Kirkhope, leader of the Conservative MEPs, was able to go full time. It now has seven full-time members of staff, including a newly appointed agent in a satellite office in the West Midlands to boost grassroots campaigning. It also has a North East branch in Durham. The Taxpayers' Alliance is a limited company, as opposed to a charitable trust, which are banned from political campaigning, but it operates on a "not for profit basis", says Mr Elliott. He adds: "We don't answer to the tune of any one big donor, so if any of our donors broke away it wouldn't actually put us in a financially difficult situation, because no one donor has actually given us more than 5% of our annual budget." 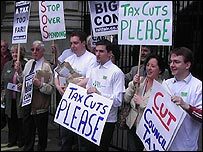 In its short life, the group has succeeded in establishing itself as a "voice" for British taxpayers in the news media. Mr Elliott also believes it has helped change the terms of the political debate on tax - with the link between government spending and waste firmly established in the public's mind and both main party leaders feeling obliged to at least talk about tax cuts, if not exactly pledge to deliver them. Its biggest and, in Mr Elliott's view, most surprising success has been over inheritance tax - a campaign he thought might have relatively limited appeal to voters until shadow chancellor George Osborne made his now famous announcement at last year's Tory conference. The positive reaction to the Tory inheritance tax cut pledge - and the way it was quickly taken up by Labour - was, for Mr Elliott, the clearest sign that their message was in tune with the times.